Sigurd is a Nord living in Whiterun. He works for Belethor at Belethor's General Goods, which incidentally is the only information you will get out of him. He sleeps above the main trading room every night between midnight and 8am. After waking up, he immediately leaves the shop and spends the next twelve hours chopping wood on the block around the corner from the store entrance. At 10pm, and again at 2pm, he will pick up the freshly chopped wood and deliver it to Warmaiden's. At 4pm he enters the store and spends four hours sweeping the floor. His evenings are spent relaxing inside the Bannered Mare. If Whiterun is damaged as part of the civil war, Sigurd will change his daily routine slightly and will spend the first three hours of the day repairing the northern wall of the store with a hammer. 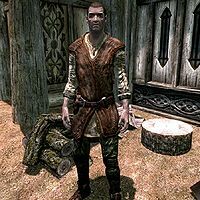 Sigurd wields an iron dagger and wears a regular set of farm clothes along with a pair of boots. He carries a selection of common items and gold. When you approach him, he will not hesitate to explain his involvement with Belethor's store, saying: "I work for Belethor, at the general goods store. ", "Come by Belethor's shop, at the market. I'm sure we've got something you need." or "Shop at Belethor's for the best prices and selection. He pays me to say that." At other times he will simply say: "Don't mean to be rude, but I'm too busy to talk right now." This page was last modified on 12 December 2013, at 23:08.